It’s all relative. When it comes to things like camping, I am not very adventurous. If we aren’t staying in a 5 star hotel, I am not pleased. But when it comes to food, you might as well call me Indiana Jones. I am happy to try any cuisine, be it from Ethiopia, Yemen, Korea, Sri Lanka, or anywhere really. I have eaten from the (probably Hepatitis infected) Pani Puri stands on Chowpatty beach in Mumbai, to Gordon Ramsay’s elegant cuisine at Verre, and even tried garlic fried mealworms in my college Entomology class. I feel that food tastes even better when you are enjoying it with someone who shares your passion for it. So imagine my agony when I found out my true love did not share my same palate. He thought foie gras was foie-gross and unagi was u-nasty. And needless to say, he was horrified at the fried insect “snacks” from the food carts we saw in Bangkok. After we got married, I tried to tempt him with my savory salmon cake draped with caviar and dill, or attempted to entice him with my Moroccan pumpkin tagine. But alas, he was not impressed. No matter what I did, it did not remind him of the taste of “home.” Then I realized I was going about it all wrong. It wasn’t about being grandiose or fancy, it was more about simplicity and comfort and familiarity. And what would bring him that gustatory satisfaction? A mere dal chawal. 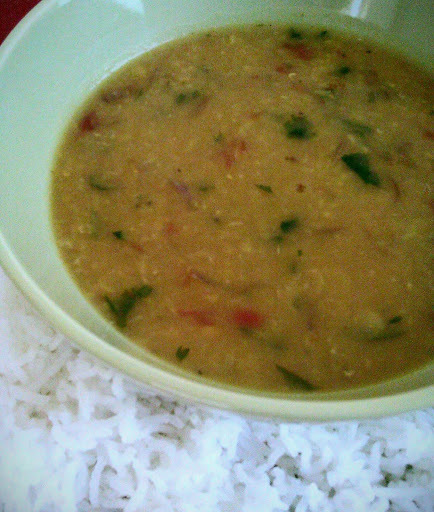 Dal and rice. The most humble dish. At first I turned up my nose. Dal? That’s it?? But then I realized how perfect this simple dish was. All at once it was healthy, tasty, budget friendly, and finally with some training, easy to make. 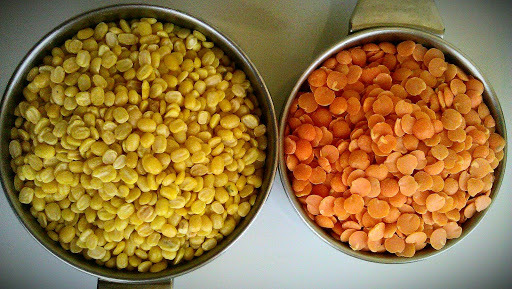 Because dal is so versatile, and there are so many varieties, nearly everyone makes it differently. So the last time I was in Lahore, my hubby’s talented sister showed me how they made it in their home. I stood by with a notebook in hand trying to jot down approximate measurements, and after a lot of practice, have made this dal so that even my picky Lahori munda asks for seconds. And he meant it. If that isn’t true love, then I don’t know what is. 2. While dal cooks, chop vegetables. In separate hot skillet add 3 tbsp oil. Add onion and cook until golden brown. Add ginger, then tomato, then green chilis (if using). Add coriander and fry until becomes a paste. You may have to add a little water so it doesn’t stick to pan. When all a paste, add into hot (already cooked )dal and mix. Serve with steamed basmati rice. Garnish with lemon if desired. Generously serves 4 people. If you let this sit around for a bit before serving it, it tastes even better as the flavors come together. Dal tastes really good the next day, and is suitable for freezing. I also serve this to my babies. 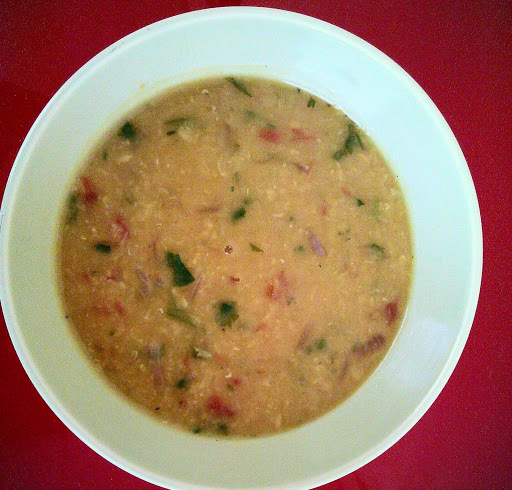 It is a bit spicy, so I usually add in a couple scoops of yogurt to the dal and rice and blend it all together. You can also make a separate batch with no chili powder if your kids are very sensitive. This version is done on a stovetop instead of a pressure cooker since both my husband and I are afraid of pressure cookers exploding. Even with this stovetop method, from start to finish the whole process takes me about 45 minutes max. This entry was posted in Indian/Pakistani Recipes, Main Course, Vegetarian and tagged Dal Tadka, indian food, Vegetarian by thepantrydiva. Bookmark the permalink. I made it earlier this week, and it was so truly good!